For the Notebook at Mubi, I wrote about William Friedkin’s 2006 adaptation of the Tracy Letts play Bug. This article was originally to be published by Fandor in 2014, to coincide with the US blu-ray release of Sorcerer. The story of Sorcerer’s box office failure, following its release in 1977, is well known and will undoubtedly be recounted many more times when the film is released for the first time on Blu-ray. At that historical moment, when the film industry changed forever, the anticipation of seeing how director William Friedkin would reinvigorate the big screen following the enormous success of both The French Connection (1971) and The Exorcist (1973) was unexpectedly eclipsed by the phenomenon of Star Wars (1977) which had appeared a month before the film premiered. This is the story told simply, anyway. The storyline of Sorcerer is also one that has been told before. George Arnaud’s novel The Wages of Fear had already inspired two film adaptations before Friedkin acquired the rights to it, Le Salaire de la peur (1953), directed by Henri-Georges Clouzot, and Violent Road (1958), which does not credit its source. The plot components are sparse; bones of numerous other tales of peril, of men thrown together into a life-draining situation and left to fight their environment, and each other. Four outlaws of different nationalities, hiding out in the same Central American slum, gain an opportunity to make enough cash to move on out, by driving two trucks of unstable nitroglycerine more than 200 miles through treacherous mountain passes and jungle – to put out a raging oil fire. Hostilities between the men grow out of the network of gazes between them, their often muted suspicion and evident physical unease ratcheting up the intensity. The screenplay by Walon Green, already reputed for his story The Wild Bunch, upon which Sam Peckinpah’s coruscating western is based, draws out the governing forces of the contemporary world: crime, oil, money and politics – and the fatal consequences of mutual antagonism and rabid self-interest. The attendant story elements are not without contemporary relevance either: terrorism, banking fraud, corporate manslaughter. 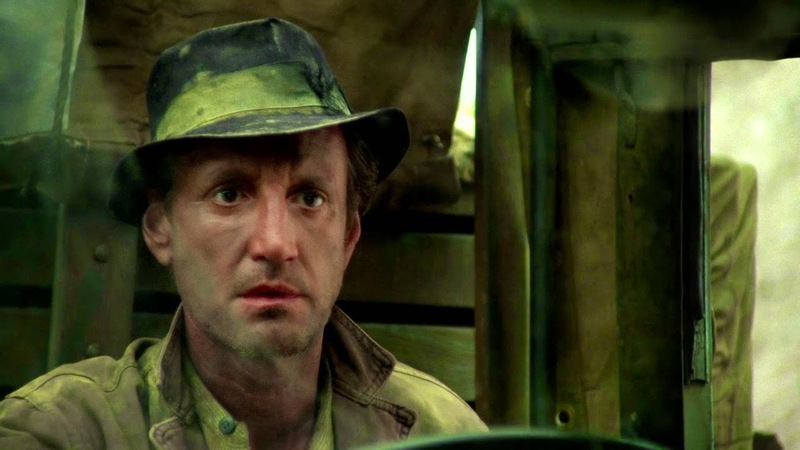 In Sorcerer the results of these narrative bare essentials are more explosive and exhausting than previously depicted. The film’s characters and audience alike are pulled towards a harrowing existential desert, where death laughs maniacally, only fire can fight fire and inescapable violence underwrites the drama. Sorcerer is a masterpiece of tense action and an illustration of a perceived grim logic that underpins nature and humanity, as seen through the eyes of its writer and director. Although Friedkin admitted to Clouzot that he could never hope to make a better film than the 1953 version, and despite the daunting example set by the French filmmaker, Friedkin and his many collaborators (tales of numerous personnel changes, largely due to illness, and dismissals have been recounted over the years) achieved moments of horror in Sorcerer that very few filmmakers have matched before or since – the most obvious being the perilous ropebridge crossing which both trucks must make. Inhospitable climates are familiar to Friedkin’s films, where much of the action unravels in typically overheated (or in the case of The Exorcist, sub-zero) zones, which cause confusion and aggression. The humid, consuming wildgrounds of Sorcerer and the seemingly hopeless task at hand also bring to mind two films by an equally fearless director with a similarly unromanticized view of the world around him: Werner Herzog’s Aguirre, Wrath of God (1972) and Fitzcarraldo (1982). All three films have a visceral power and portray the terrifying lengths to which man will go in pursuit of a goal, no matter how irrational. Unusual for a Hollywood film, Friedkin shares with Herzog a determination to venture into challenging terrain – away from the comforts and artificial controls of the studio lot – often testing the vigour and commitment of his colleagues. The overlap between the two aesthetics is extended on the soundtrack, in synthesized scores provided by Tangerine Dream and Popol Vuh respectively. Using Edgar Froese and co’s stark discords and hypnotic cycles, Friedkin creates an ambiguous tone, between the urgency of survival and the submission to the insurmountable forces of nature and time. The Hollywood directors who thrived creatively during the 1960s and 1970s had soaked up the images and the technical innovation of the European, Scandinavian and Japanese auteurs of the preceding decades. 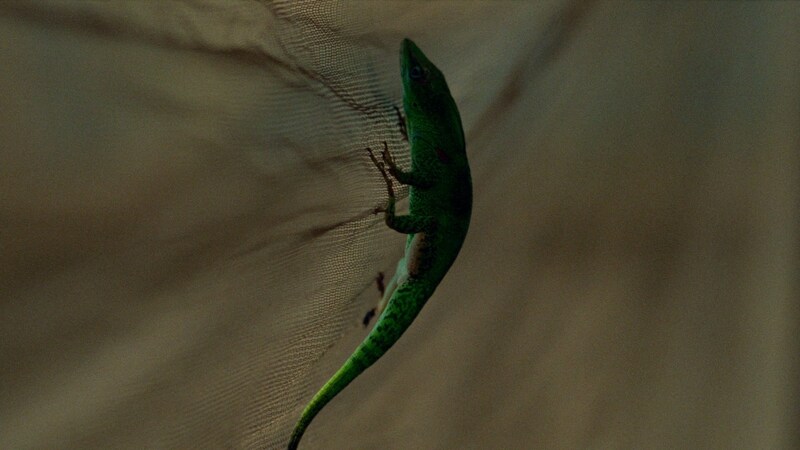 Friedkin uses both the on-the-fly newsreel immediacy of Costa-Gavras’s Z (1969) – an acknowledged template for the director – and at various points calls to mind the landscape poetics of Antonioni, and the silent and psychologically mysterious character interactions of Bresson and Melville. Sorcerer also bears curious similarities with J Lee Thompson’s Ice Cold in Alex (1958). The extent to which Friedkin transmuted a rugged genre movie – the kind typical among the supporting B films from the golden years of public filmgoing – with the stylistic force of all these European filmmakers, yet in a fairly self-effacing manner, is still unique. It’s a potent blend of cinematic elements that never forgets the demands of the big-screen entertainment spectacle, and continued a trend of reigniting the classical genre films that saw Friedkin achieve great success beginning with The French Connection in 1971. It is well known too that Steve McQueen was intended for the role of Jackie Scanlon, which was eventually given to Roy Scheider. From Friedkin’s point of view, letting McQueen get away was a catastrophic artistic mistake. There’s no need to imagine, however, what could have been since what Scheider and the other little-known actors – Bruno Cremer, Kassem, Francisco Rabal – all bring to the story is a palpable uncertainty and fear. Through the suspicious glances that these men exchange, we’re not sure who can be trusted to reflect our most noble sentiments. We might too easily anticipate that McQueen, the Great Escapee and Glass Tower hero, will cross the line, get to the fire this time. Without his obvious star quality, the forecast is gloomy and there’s no telling who might live or die. Friedkin’s strongest works are characterised by their relentless negativity, by a sense of unconquerable evil, of widespread violence and other criminal behaviour. Sorcerer is no exception. The cruel finale of the film only emphasises the terms of this worldview: any change is a violent operation, and that’s really no change at all. The Exorcist (1973), Cruising (1980), To Live and Die in LA (1985) and Bug (2006) each involve, at a crucial point, the sublimation of one identity by another, and the propagation of violence by consequence of destructive, psychological force. The four main characters of Sorcerer are living incognito, each with a pseudonym to elude the law, but each retains his personal identity. If the world cannot change them, it must destroy them. It might seem unsurprising that the general public were not eager to embrace such a grim vision, especially when a younger filmmaker was offering them a more hopeful fantasy space saga, in which good and evil were literally distinguished as black and white. But it is all too easy to underestimate the audience’s capacity to respond energetically to a work so devoid of hope, just by taking the sudden, earth-shattering success of Star Wars (a new hope!) as a yardstick of popular taste. It is lazy to equate the disinterest with Sorcerer with an inability to engage intellectually with the dense layers of intertextuality and the pessimistic outlook of the film – especially since the bravura setpieces would probably hold anyone’s attention. As with all events the reasons for the film’s lack of success then were no doubt myriad, complex and like Sorcerer itself, somewhat mysterious too. The physical power of the film will probably capture new viewers today, especially those with a desire to escape the slick artillery of computer-generated tics in modern mainstream entertainment films. The capacity of the general public to make or break a film with admission tickets is thankfully matched by film culture’s unceasing capacity to restore lost gems and reignite a fervent, if smaller scale, interest in such great overlooked works. For the series ‘The Details’, I wrote about the money forging scene in William Friedkin’s To Live and Die in LA for The Notebook at Mubi.com. This was first published in April 2014. 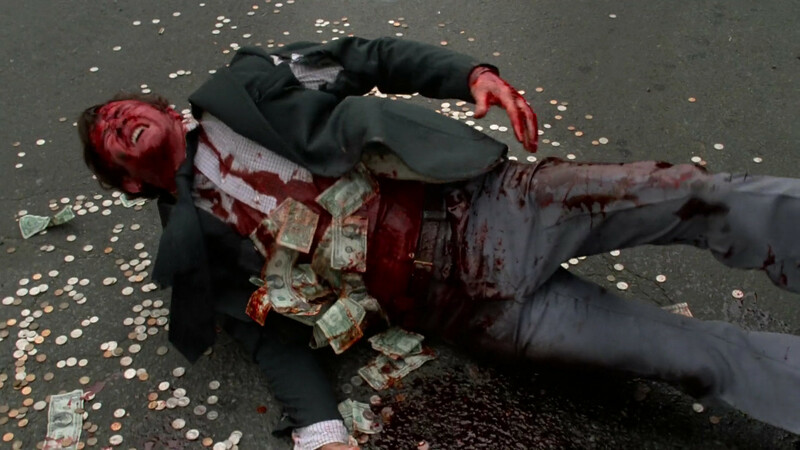 The desire for money, for personal gain or business interests, is a frequent catalyst for dramatic action in William Friedkin’s films. In The Night They Raided Minsky’s (1968), The French Connection (1971), Sorcerer (1977), The Brink’s Job (1978), Deal of the Century (1983), To Live and Die in L.A.(1985), Blue Chips (1994) and, more recently, Killer Joe (2011), the pursuit of money entails underhand tactics, struggle, betrayal and violence. Dollar bills are passed from one person to another, in plain view or sight unseen; or promised at the completion of a job; or seized, burned or spent. But the money always materializes again, somehow, coursing into the narrative economy and organizing social relations. In a notable sequence in To Live and Die in L.A. we see this material created illegally, and witness its eruption and flow into the system. 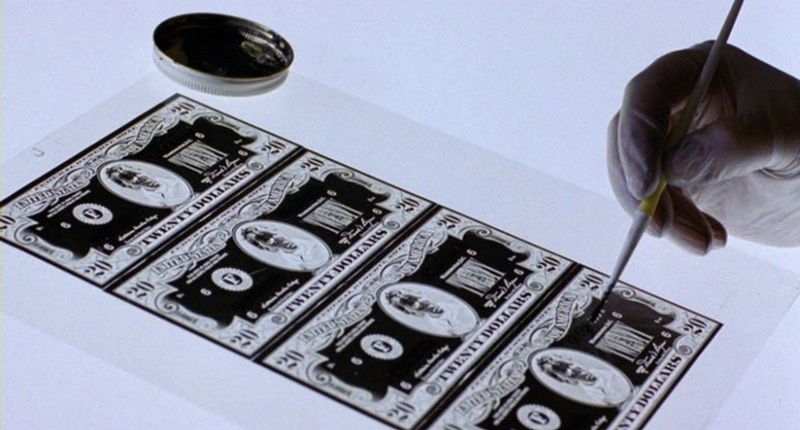 Friedkin here offers an alternative vision to the public information images of official engraving and printing of money in Trapped (1949), an earlier film noir directed by Richard Fleischer about the US Treasury’s efforts to stop forgery. Eric Masters (Willem Dafoe), a counterfeiter and painter, dressed in a kimono that gives the scene a slightly ceremonial air, carefully aligns four bills on a copier. With the sharp electric crackle of a lamp, and its flash of fluorescent light, a negative is created. Under the safelight of the dark room, the bathed negative appears blood soaked. In silent concentration Masters makes slight alterations to the template, brushing black paint across white flecks, obscuring the serial numbers, the Treasury seals of the source notes, and the dust of the photographic duplication stage. He wields his scalpel with the confidence and precision of a skilled artisan. The soundtrack is at first only punctuated by the scraping, clicking and dabbing of the operation. The potential for invisibility needed of this illegal tender, so that the fraud remains inconspicuous, comes naturally; the source image, on an exposed aluminium lithographic plate, is seen only when a single breath warms it—or is revealed by the alchemy of gum and developing fluid. Light, record, develop, edit, copy: stages of commercial filmmaking itself, an industry also directed toward financial gain. The red developer drips like blood onto the metal sheet, and is smeared across it by Masters’s hand wiping rapidly—the association of violence; the speed and vigour of the criminal enterprise. The beat of a musical theme composed by Wang Chung drops onto the audio track and the song ‘City of Angels’ plays, its drum track sliding into the rhythms of the multilith machine. Just as the electronic instrumentation (drums and synth) of this Eighties pop music allows the endless replication of one programmed beat or pattern of notes, Masters’s counterfeiting procedure churns out copies of a source twenty dollar bill. Four quick cuts mimic the guillotine that slices a set of notes into stacks of single bills. 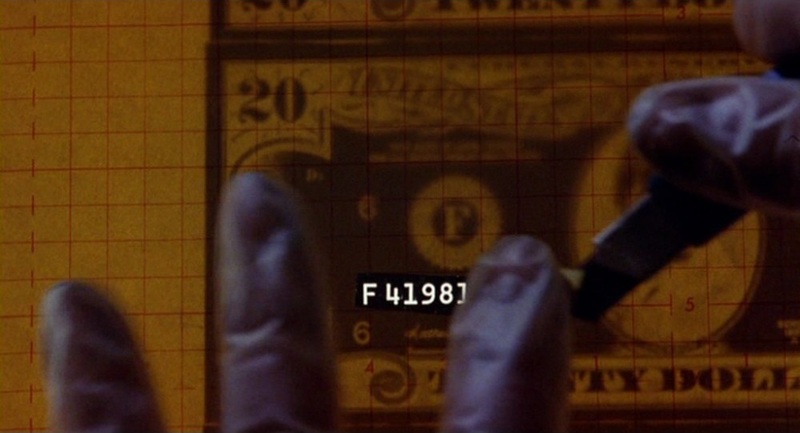 The pulse of the production of money almost matches the tempo of the score and guides the editing of the image. 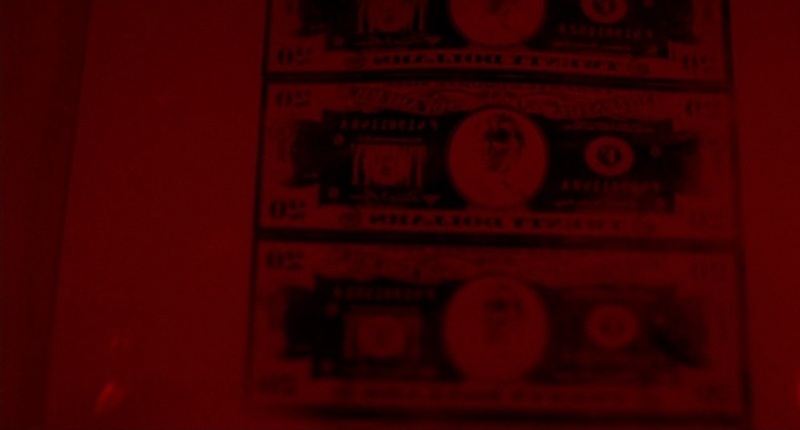 It is there in the opening credits sequence too, where we see the subtle synchronicity between this musical motif, the movement of money, counted quickly by dealers on the streets of L.A, and the assembly of shots. Such a lengthy, wordless sequence focused on work by hand, on artisanal craft or toil, is not all that common outside of the documentary film. There is the safecracking in Michael Mann’s Thief (1981) and other heist movies, and the painstaking efforts of prison escapees, like those of Fontaine in A Man Escaped (1956). That film’s director, Robert Bresson, preceded Friedkin, too, in evoking a detailed range of textures through sound design over a seemingly quiet scene. 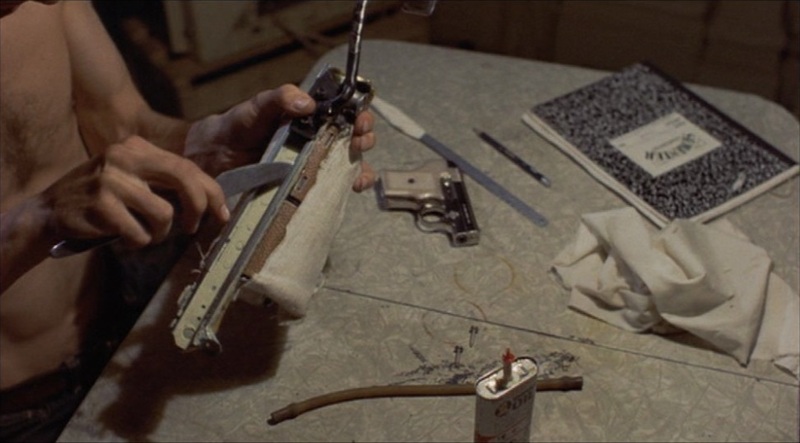 Bearing in mind this cinematic influence, one might also recall Travis Bickle’s nighttime workshop in Taxi Driver (1976), where a mechanical appendage for the ejection of a gun is fashioned by the lonesome cabbie. The precision and force of the human hand—and of the filmmaking apparatus as it is handled, giving life to these images—are captured in these moments. It is not at all unusual in the films of William Friedkin, though. Friedkin has brought to the cinema some of the most exquisite sequences of human labour, of meticulous handiwork, and the sweat and the strain of a troublesome, pressing task—from the car stripping in the search for drugs inThe French Connection to the ritual to ward off evil in The Exorcist (1973), and the fashioning of a primitive knife for survival in The Hunted (2003). 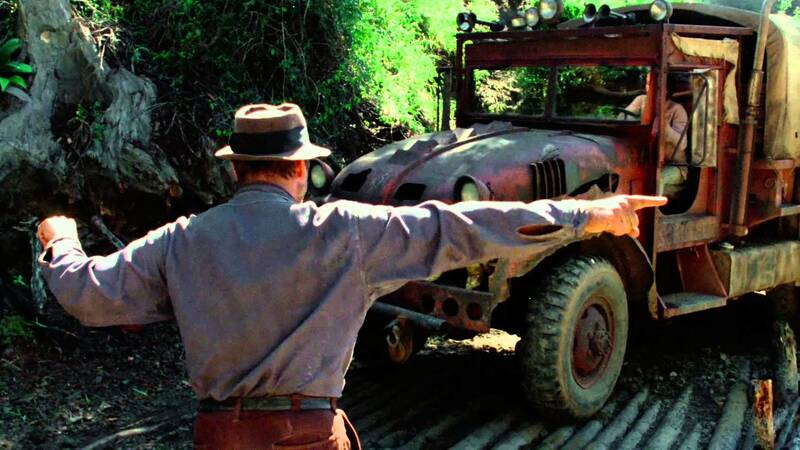 The second half of Sorcerer is one of the longest sustained depictions of hard graft in a popular narrative film. Its famous bridge crossing and stone detonation set pieces, realised with distinct colours of desperation and nervous energy, are equally compelling—both built upon the potentially devastating consequences of the slightest physical movement in testing circumstances. The most beautiful example, however, is found in this passage in To Live and Die in L.A. As we see the means by which Eric Masters forges money in his desert warehouse far from prying eyes, image and sound are powerfully interlocked. Like Masters himself, we are apt to take pleasure as we observe. The thrill of this transgression fits Friedkin’s worldview neatly, since the artistic capability that the apparently villainous character displays here contrasts uneasily with the reckless determination and collateral damage caused throughout the film by the representative of the Law, Treasury Agent Richard Chance (William Petersen). Fake or genuine, good or bad, the value of objects, of motives and ethics blur in the smog and heat of L.A. And it is tokens of chance that finalise the counterfeiting process, as Masters tosses blue and white poker chips into a dryer along with big clutches of ‘paper,’ and the cycle begins again.